Home›Reviews›UFO - High Stakes and Dangerous Men tells the story of one of rock and roll's most criminally underrated bands! UFO - High Stakes and Dangerous Men tells the story of one of rock and roll's most criminally underrated bands! High Stakes and Dangerous Men – The UFO Story is a book by Neil Daniels, released in 2013. It is an unofficial biography not directly endorsed by the band/members/etc. UFO stands as one of the most criminally underrated rock bands on all time, yet also one of the most influential. 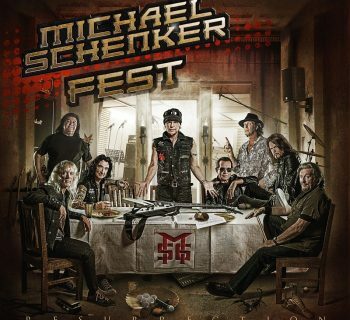 Hailing from England and coming from bizarre “space rock” beginnings, it was when young German guitar virtuoso Michael Schenker joined in the mid 1970s that they truly cemented a rock and roll legacy that stands as one of rock’s best. 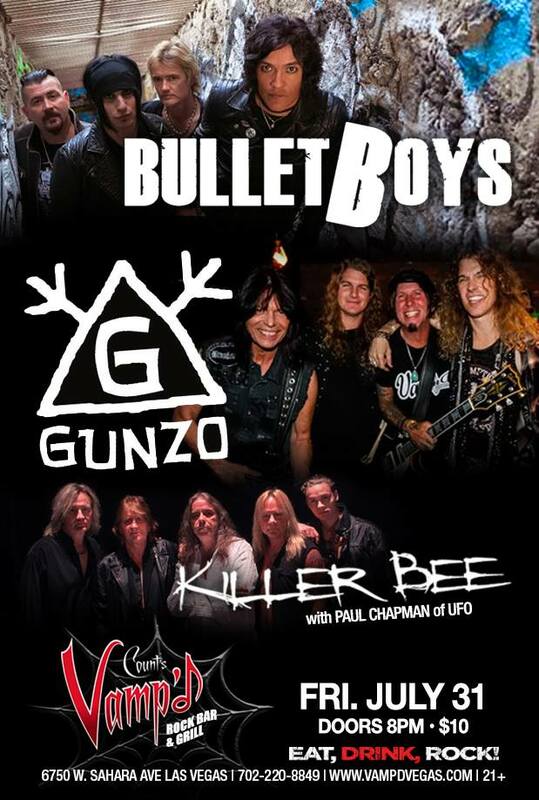 Throughout numerous lineup changes, reformations, and reinventions, they are still going strong as one of England’s finest, in a lineup that has since grown to include American guitarist Vinnie Moore. You will not find a bigger fan of UFO than me (okay, MAYBE Eddie Trunk. But that’s a story for another day). Despite their influential nature, the band never gets the proper credit. As such, there are not many books out there dedicated to the band, and to date, no authorized ones that have been written by any member of the band. 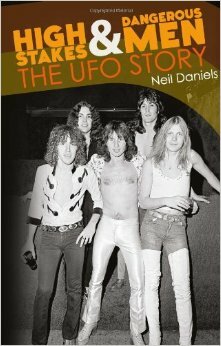 Rock author Neil Daniels has attempted to capture the band’s legacy, discography, and highs and lows alike in his book, High States and Dangerous Men – The UFO Story. High Stakes and Dangerous Men covers the different eras of UFO, with each chapter divided up by era. Each chapter contains an overview of said era, excerpts from interviews (some from other, existing interviews, others done by Daniels for this book directly), song-by-song analyses and discographies/tracklists of official band releases. If you are a UFO fan, you will find a lot to enjoy about High Stakes and Dangerous Men. Daniels breaks down many of the specifics when it comes to the band’s discography and musical library, as well as facts regarding band history. The problem with the book, however, is that it is not written by someone who is actually in the band or from their direct organization, so it comes off feeling like something of a rushed afterthought at times. 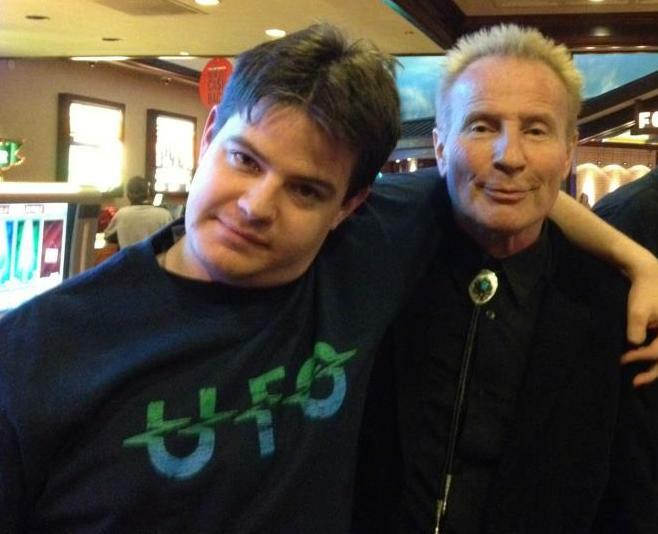 Review author Taylor Carlson (left) with UFO vocalist Phil Mogg (right). 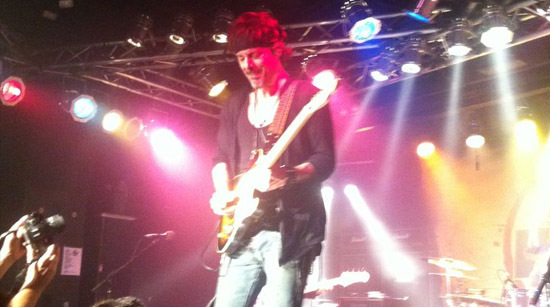 Taken at UFO's Boulder Station concert, December 2012. As far as the positives go here, you are going to see for yourself that Daniels is very meticulous when it comes to getting info on UFO. He has culled numerous sources and resources for interview clips, and done plenty of work on his own to gather new interview content as well. 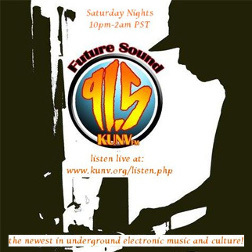 The result gives you perspectives of musicians in the band, other related personnel in the industry, and so forth. There is information on each official album, track descriptions, and assorted other content that the fan is going to enjoy reading. One cannot deny the info in here, even if it is not quite what one would consider the “definitive” UFO retrospective. On a less positive note, the book feels like something of an unfinished “hodgepodge” of content. As it is not written by someone in or directly involved with the band, the tone is all over the place, and it lacks the “personal” feel you get from one of those direct autobiographies. At times it feels like events skip around and feel incomplete’ the inconsistent tone here does not help things any. You get a general idea of what has happened over the course of the band’s career, but it is far from being a complete picture of it all. Unfortunately, when it comes to UFO there are just not that many resources available, as any fan of the group has come to know. While High Stakes and Dangerous Men is far from a perfect book, it should be more than satisfactory for most UFO fans that want to delve deeper into one of classic hard rock’s most underrated groups. This fan is hoping for an official band-sanctioned book down the road, but in the meantime, this will do.